I once visited a friend in Colorado and she took me up some mountain for a hike. 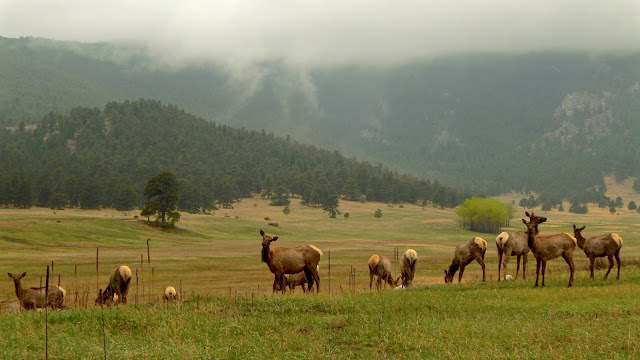 What particularly fascinated me was passing a meadow where elk were grazing. A wonderful sight. The elk are such impressive creatures. Fortunately, they are a common sight in this mountain meadow. Elk are impressive creatures. During my first drive through the forest south of Happy Camp, CA, a herd of elk suddenly converged around my car as they crossed the road. I love when things like that happen. You live in a beautiful place. Thanks, I've also been involved in an "Elk Jam" before. We have to be very careful driving around up here especially after dark. Love this shot of the elk Dan. I have some nice shots from Idaho and Oregon I've taken and there is a place here in Kentucky that I want to do a photo shoot at as well. Can't wait to see what F brings us! Thanks, they are very common here but I didn't realize there were elk in Kentucky.